After the surprise wore off, it was time to explain how those gaps were formed. Ben’s recent astrobite showed that the gaps are located where various molecules turn into ices and help planet formation get started. Today’s paper addresses another puzzle in this image: why are there no spirals? Spiral structure is seen in simulations of planet formation where gaps form, so the authors of this paper set out to see if they could reproduce the concentric rings in the image using a hydrodynamic simulation of the system. Figure 2. Simulation of a gas disk with planets. 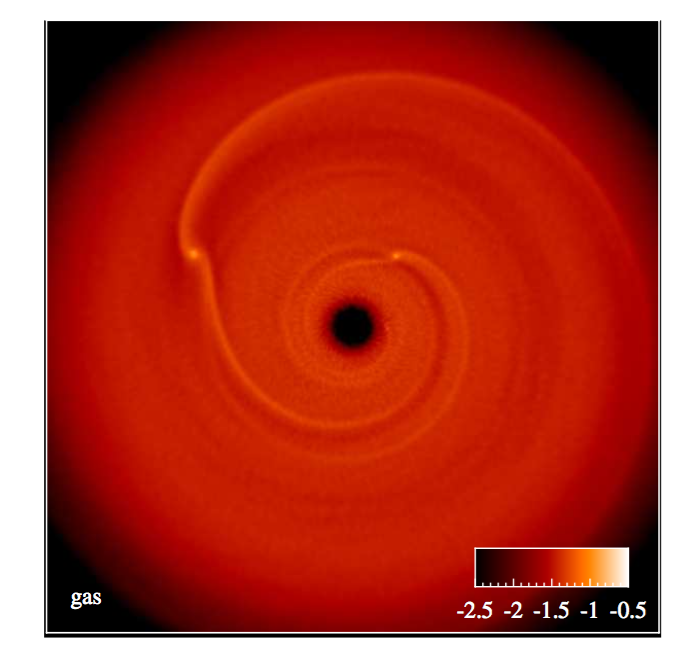 Spiral structure is ubiquitous in simulations of planets (seen as the three bright dots) embedded in gas disks. The spiral waves come from the gravitational pull of the planets on the surrounding gas. To find out if planets produce the observed structure of the disk, the authors conducted hydrodynamic simulations of the system. The ALMA observation shows emission from dust grains in the disk, so the authors simulated both dust and gas components. The authors adopt a simple power-law for the initial density profile of both dust and gas. To simulate the presence of planets, the authors placed three particles in orbit at the location of the three most prominent gaps. The masses of these planets play a large role in how gaps are carved in the disk, so they experimented with different masses until a set was found that matched the ALMA image best. As dust grains move through the disk, they feel a drag from the surrounding gas, which can cause the dust component to develop a different structure from the gas. This drag force is more noticeable as the dust grains increase in size. 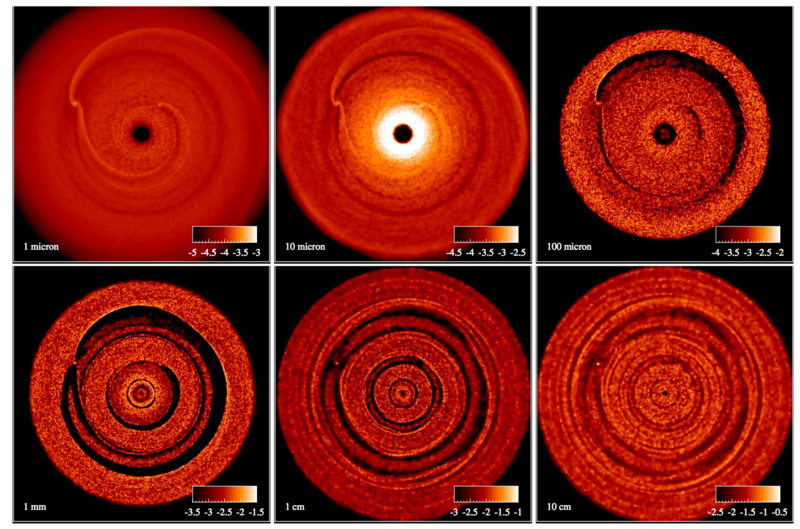 So the authors ran six different simulations of the disk using six different dust grain sizes, from 1 micron to 10 cm. Figure 3 shows the effect of the dust grain size on the evolution of the dust surface density. Figure 3. Surface density of dust in six simulation runs with different dust grain sizes, indicated in the lower left. The ALMA image is dominated by emission from mm-size dust grains. These grains show similar structure to the observed disk, while smaller grains are tightly bound to the gas and show spiral waves. The ALMA image was taken at a wavelength of 1.3 mm, where the emission is dominated by the mm-size dust grains. The distribution of these grains shows clear concentric gaps and no spiral structure! It appears that planets can shape the dust into the observed configuration, while the gas disk may still show the textbook spiral density waves. Crucially, the dust and gas must both be simulated to realistically represent the protoplanetary environment. To compare the results of their simulations directly to the ALMA image, the authors made mock observations of the simulations that match the specifications of ALMA. The results of these mock observations are shown in Figure 4. The mock is remarkably similar to the real image. The simulated scenario of planets carving gaps in the dust is a good bet to explain what we are actually seeing. Figure 4. ALMA image (left) vs. simulation (right). Brighter color represents stronger emission. The colorbars show that the simulated disk has much weaker overall emission. This could be explained by a steeper density profile. The overall structure of the gaps is remarkably similar. Remember, the figure on the left is the real image! 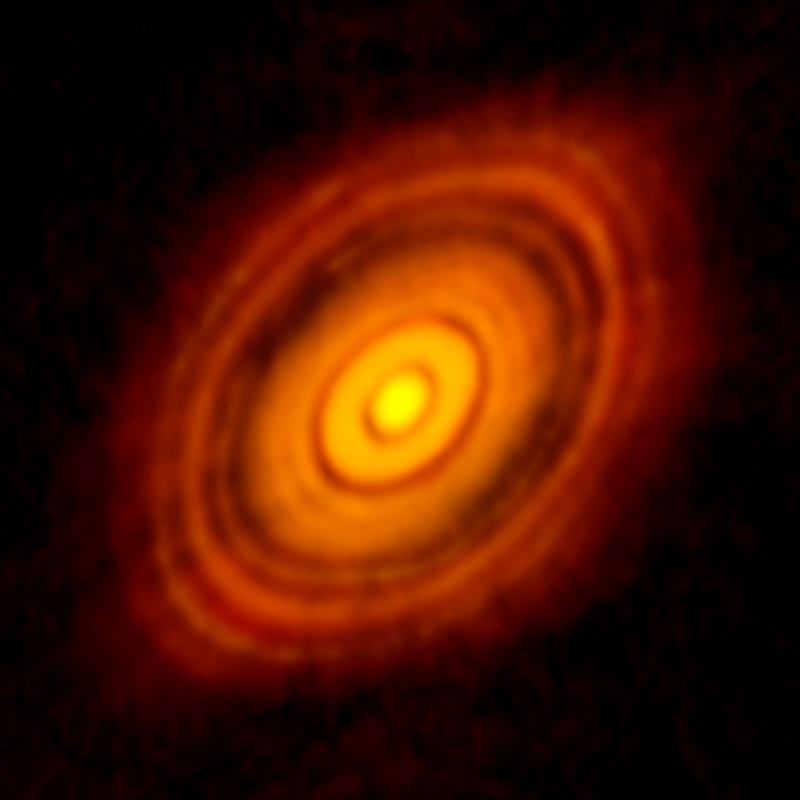 The ALMA image of HL Tau is best matched by a disk of dust and gas with three planets of approximately 0.2, 0.27, and 0.55 Jupiter masses. The imaged emission is coming from mm-size dust grains, which do not show spiral structure in the simulation. The models are still quite uncertain, as the authors had to make assumptions about the density distribution and thickness of the disk. But the results confirm that ALMA has begun to uncover planet formation at a scale previously reserved for artistic renditions. More such discoveries are sure to come, as ALMA has only begun to operate in this extended configuration. Stay tuned, and mind the gaps! Where to Look for Baby Planets Disk Destruction in the Trapezium Will the real Protoplanetary Disk Mass please stand up? How can planets be heavier than the disks that formed them? Wow – that is some serious resolution! Soon be time to start looking for FUOR activity? Anything else similar observed in the Tau-Aur starforming regions?